The opinions expressed in our new items and other published works are those of the author(s) and do not necessarily reflect the opinions of Smart About Salt Council (referred to as SASC) or its Directors, Officers, Volunteer, agents or staff. All rights reserved. No part of any SASC published work may be reproduced, stored in a retrieval system, or transmitted in any form or by any means, electronic, mechanical, photocopying, recording, or otherwise, without written permission from the publisher. Information contained in our published works have been obtained by SASC from sources believed to be reliable. However, neither SASC nor its authors guarantees the accuracy or completeness of any information published herein and neither SASC nor its authors shall be responsible for any errors, omissions, or claims for damages, including exemplary damages, arising out of use, inability to use, or with regard to the accuracy or sufficiency of the information contained in SASC publications. Landscape Ontario's Horticultural Review includes a regular column on Smart About Salt. The November 2011 issue talks about ways to be proactive to reduce ice buildup from water run off and snow melt. Landscape Ontario's Horticultural Review includes a regular column on Smart About Salt. The October 2011 issue includes information on contract requiring contractors to be Smart About Salt certified. The Ontario Good Roads Association has championed good salt management on municipal roads over the past decade. It is also supportive of the Smart About Salt program as the logical next step for municipalities in their efforts to manage the total amount of road salt they use. Read the Milestones Article. Bob Hodgins, Executive Director, Smart About Salt (SAS) Council has been in discussions with GO Transit to bring the Smart About Salt Program to GO’s facilities. GO Transit has over 60 sites consisting of parking lots and platforms. Given the high degree of public traffic at these sites, good winter maintenance practices are essential to public safety. GO’s plan is to phase the Smart About Salt program into its operations as contracts become due. Eventually, contractors will be required to be Smart About Salt Certified to be eligible to bid on GO’s snow and ice control contracts. Contracts going out this year will allow time for contractors to become SAS certified by requiring them to register for designation this year and complete the certification process by early 2012 prior to the start of the second year of the contracts. Contractors who wish to bid on GO Transit snow and ice control contracts are urged to start the Certification process by registering online or downloading and emailing their registration of their intent to become certified to the Smart About Salt Council at smartaboutsalt@bell.net. Alex Piggott, City of Woodstock's Works Superintendent is including the Smart About Salt Program in the City's efforts to manage the environmental effects of road salt being used by the City while ensuring safe winter travel. In the City's most recent Parking Lot Winter Maintenance Tender, Alex has put snow and ice contractors on notice that all future tenders will require contractors to be Smart About Salt certified and trained. "We see the Smart About Salt program as the perfect vehicle for meeting our environmental and safety objectives by improving salt management at our facilities." says Piggott. Bob Hodgins, Executive Director, Smart About Salt Council spoke to the City of Woodstock's Environmental Advisory Committee on August 8th as part of the program's ongoing efforts to promote the benefits of being Smart About Salt. Smart About Salt Certified contractors are dedicated to proactive winter control using best management practices to reduce winter related risks. “SAS certified contractors know that being proactive, using the right tools and maintaining accurate and detailed records are the keys to reducing their liability”, says Bob Hodgins, Executive Director, Smart About Salt Council. The program also requires facility owners that want to become SAS Certified to conduct a risk audit of their sites to identify high risk areas and develop strategies to reduce the potential for slip/falls. The partnership model that the Smart About Salt Program promotes between facility and contractor is the best way to work together to manage risk. The Smart About Salt Council and Marsh Canada will work together to develop ways that serve the snow and ice control industry and their clients. During the Walkerton Inquiry, Justice Dennis O'Connor wrote "The first barrier to the contamination of drinking water involves protecting the sources of drinking water." To this end, the Province of Ontario passed the Clean Water Act and launched a program to prepare local plans to protect drinking water. These plans are being developed under the purview of Ontario's Conservation Authorities. Road salt has been identified as one of the threats that need to be considered in preparing Source Protection Plans. The Smart About Salt Council has prepared a brief SAS and Source Protection.pdf to show how the Smart About Salt Program can help in managing salt loadings to vulnerable source water. This brief has been provided to those leading the Source Protection Process. We continue to spread the word on behalf of our members about how Smart About Salt Certified Contractors and Facilities are committed to implementing best salt management practices. The Award acknowledges the contribution made by the Regional Municipality of Waterloo and its consultant (Ecoplans Limited) in developing a ground breaking program that works with contractors and facility owners to improve salt management. In particular the training and education programs were recognized. 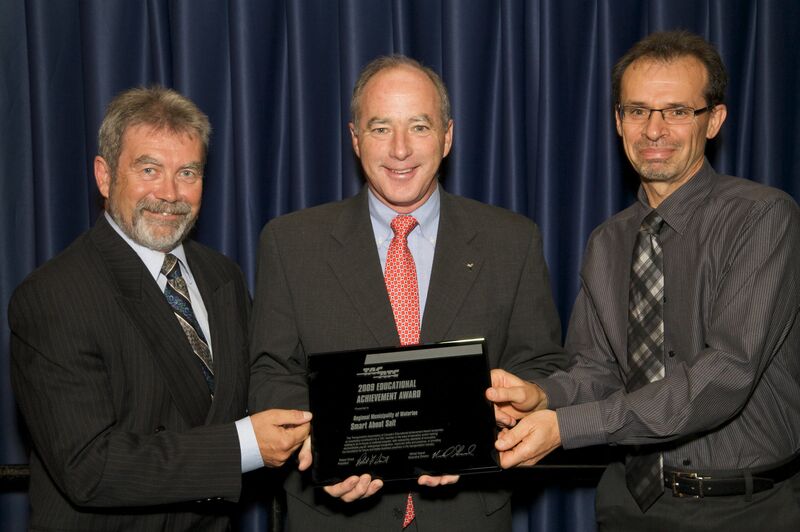 The picture shows the award being accepted by Bob Hodgins (left), past president of Ecoplans Ltd, co-designer of the program and current Executive Director of the Smart About Salt Council; and John Hammer (right), Director of Transportation, Region of Waterloo. The Award was presented by Ray Mantha, Executive Director and Chief Engineer - Ministry of Transportation Ontario. The Smart About Salt Council is pleased to announce that the Ontario Good Roads Association (OGRA) has joined its Board of Directors. "Paul Johnson of Wellington Country, OGRA's representative, has been a leader in salt management in the public sector and will be a valuable addition to the Board" says Bob Hodgins, Executive Director. "The OGRA provides a needed link to help bring the Smart About Salt Program into municipalities. The municipal sector has been very proactive in implementing salt management on their road systems. They can now carry that commitment to salt management to their parking lots by becoming a Smart About Salt Community like the Regional Municipality of Waterloo". Learn more about OGRA at www.ogra.org. The Board of Directors of the Smart About Salt Council is pleased to welcome Bob Hodgins as the new Executive Director of the Council - taking over from Ken Tomihiro. Bob has been a leader in salt management in Canada for over a decade and co-designed the program with the Region of Waterloo. Bob has also developed and delivered the Smart About Salt training program since the program's beginning. Bob will be leading expansion of the Smart About Salt program within Ontario. In the short time he has been Executive Director, he has made important progress at federal, provincial and municipal governments; contractors, suppliers and facility owners. "I am committed to making the Smart About Salt program the flagship program for private snow and ice control contractors serving the facility winter maintenance sector and facilities that want to be proactive in managing their winter maintenance practices and risk" says Hodgins. "Our partnership with dedicated contractors, facility managers and the insurance industry will improve snow and ice control practices, better manage risk, and reduce winter maintenance costs and environmental damage."